Need old fashioned butchery skills, experience and knowledge when it comes to buying your meat? Simply ask Jim Irvine and his team who bring a collective 40 years experience and will ensure high quality local meats are matched with the best value, variety and customer experience. We are convinced that you will build a healthy relationship with Jim and his team and they will help you answer that often asked question of ‘What’s For Dinner?’ in many households throughout Templepatrick and beyond. If you want to place and order with us to collect up to 5.30pm on the same day simply e mail us at jim.irvine@colemansgardencentre.co.uk and we will have it sitting ready for you to collect. 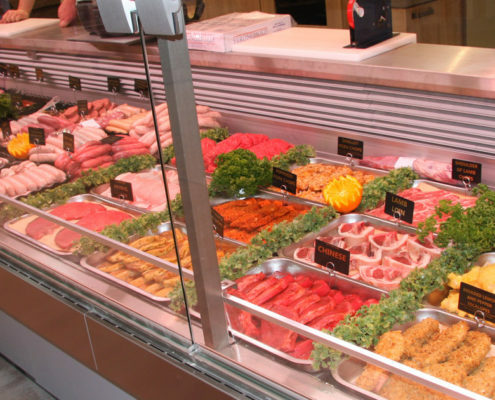 Click here to see what products we sell from our butcher’s counter. Coleman’s Butchers counter will be a great place to get your meats and so much more and you will find yourself spoilt for choice. Please make sure you introduce yourself to Jim, Owen or Richard as we want to ensure that your experience and our product offering is the best it can be …we want and need your feedback . So come on down and ask us “What’s for Dinner?’ and we will be happy to help. Don't you just love the smell of barbeque in the Spring? http://colemansgardencentre.co.uk/wp-content/uploads/2019/04/IMG_8846.jpg 630 1500 David McIlwaine http://colemansgardencentre.co.uk/wp-content/uploads/2019/03/web-logo500px2.png David McIlwaine2019-04-19 15:32:422019-04-19 15:33:43Don't you just love the smell of barbeque in the Spring?